I actually got on the train at Cleethorpes as I had come up from St Albans on a trip organised by UK Railtours called the Lincs Shires. Most people had decided to visit the Cleethorpes Coast Light Railway, but I (and a couple of others) had decided to take a risk and go on the Barton branch, getting back with less than twenty minutes to spare before departure! The train was a Class 153 "Super Sprinter" single coach, which plies up and down the line all day long on a two-hour frequency. It was about half full with a mixture of teenagers and young families returning to the outlying villages west of Grimsby. Before the train left the guard asked if anyone wanted to get off at New Clee, the first station along the line, which was obviously a request stop station, and as no one said "yes", we left soon after and missed that station out, stopping at first Grimsby Docks and then Grimsby Town stations. The latter still has much of the original station infrastructure in place, though the through tracks in the middle of the station have been lifted. On through Great Coates, the unusually named "Healing" station and Stallingborough, before we stopped at our junction station, Habrough. Like most of the stations on this line it has just the basic bus stop, though it does have two platforms being on the main line to Lincoln, Gainsborough and Scunthorpe. 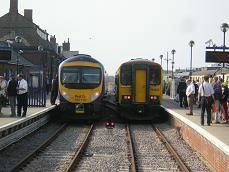 The platforms are split on either side of a level crossing, of which there are several on this line, due to the flatness of the area, having been reclaimed from the sea in the Middle Ages. In the distance you can see the oil refinery of Killingholme and a few miles to the northeast is the town of Immingham, for which this station is the railhead. Soon after leaving Habrough we cross lines and then leave the main line altogether, going in a North Westerly direction. The landscape is mainly scrubland and we go under the main A180 Grimsby to Scunthorpe trunk road, before we pull into Ulceby station. This is an important junction as trains going to and from the Immingham Docks complex pass through here at regular intervals both day and night. The station has just a single platform and a customary bus stop and soon after the track to Immingham leaves us on our right, as we continue straight on past open farmland, which is punctuated by the odd farm building. We speed up to about 60 mph, before slowing for Thornton Abbey station, which is almost identical to Ulceby, though it does have two platforms. You can see the Abbey buildings a few hundred yards away on the right hand side, and beyond that in the distance the Killingholme oil refinery. Soon after leaving Thornton Abbey station we come into Goxhill station, which does have its original station building, though it is now a private house next to the eastern platform. We move away and soon come to a stop at Oxmarsh signal box, where the driver takes the token off the signalman as we move onto signal track. We stop at New Holland station, which again has a single platform and is not the original station, being built in 1981. The line originally went straight onto New Holland Pier, where passengers could catch a ferry to Hull. This ended with the building of the Humber Bridge, though the old line does go into a small docks complex. We now turn 90O to the west, past some old sidings on the right and in the distance you can see over the Humber Estuary to the dock buildings and high rise flats of Hull on the other side of the river Humber. Back in open countryside again there are yellow fields full of rapeseed on the left, whilst on the right are various clay pits, now filled with water and used for water sports. Our next stop is Barrow Haven, which does have some light industrial buildings next to the station. We then go over a dried up creek with more views of Hull in the distance and past more filled in clay pits. Then all of a sudden on the right the massive Humber Bridge comes looming into view. It was for a time the world's longest single span bridge. After passing some more sidings we start to see rows of houses appear as we finally arrive at Barton-on-Humber station. Sadly it is a single platform with no station buildings and looks fairly bare. However, there is a plaque on the platform commemorating 150 years of trains from Barton. Further on from the station there is a bus waiting to take passengers across the Humber Bridge and into Hull. This is probably what has saved this line as with the demise of the ferry from New Holland, Barton-on-Humber became the main point of crossing for passengers travelling between Hull and Grimsby with its "Humberlink" service.